Online market places are on a rapid increase on the Internet and new avenues have opened up for freelancers to get micro jobs online, and for organizations to outsource work. The micro jobs, popularly known as ‘gigs’, are small one-time tasks or services that freelancers provide for a small fee. The micro jobbing scripts have opened up countless opportunities for freelancers to make money online. One such website that showcases gigs and connects outsourcers with freelancers is Fourerr.com. Fourerr.com is the platform on which freelancers offer jobs for a fixed rate of $4. The types of jobs could vary from writing articles to graphic design, programming, SEO and online marketing gigs, providing tips and advice on any matter, selling e-books and so on. The good thing about this site is that vendors and buyers can find exactly what they want and make several low-cost transactions. 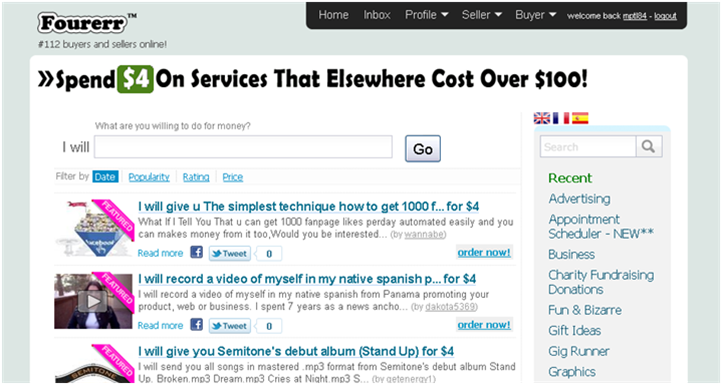 The site is fun to use and very user friendly. Once you register as a vendor, you can add gigs and provide descriptions of the services you want to sell. As a buyer, it’s really easy to search for what you want and review all the sellers before making a purchase. Buyers and vendors can communicate with one another using the messaging feature on the website, as well as keep track of their transactions. Registration at Fourerr.com is free, so if you’re looking forward to getting something done for the cheapest price or making some extra cash online, register with them and enjoy the benefits of online jobbing markets! Please feel free to add comments or add other sites that provide similar services.